India aims the Commonwealth Games will be a showcase of its economic clout, but with less than three months to go, the world's third largest sporting event is instead laying bare its perennial infrastructure problems. 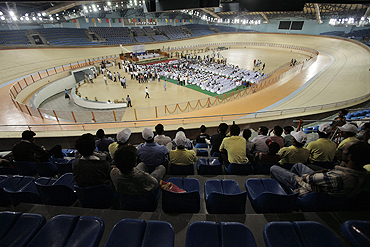 The Games, held ever four years and grouping athletes from the 54-member Commonwealth of Nations, are intended to be India's answer to the Beijing 2008 Olympics, hailed as a success for its economic and political rival China. But while China set out to wow the world with iconic structures such as the Bird's Nest stadium, many Commonwealth Games venues in New Delhi are far from finished while others are falling apart under the force of a few weeks of monsoon rains. A shooting range built for the Games, and inaugurated two months ago, was extensively damaged by heavy rains earlier this month, Indian media reported. At another complex, rains felled the false ceiling and other venues have sprung leaks. Shoddy construction is one of the challenges Asia's third-biggest economy faces as it gears up to take on big-ticket projects needed to propel growth to China's double-digit rates. Analysts say one of the main problems is a government practice of awarding contracts -regardless of their size - to the lowest bidders, which are often smaller, more aggressive, but less experienced construction firms which also lack the manpower needed to implement such projects. Contractors also sometimes take short-cuts when they're running over budget or running out of time. This often translates into sub-standard structures, and this is a problem that would remain even if the oft-cited difficulties of getting land and necessary bureaucratic clearances are solved. "Quality, yes, there is a serious issue in India. Developers are stretched and a lot of sub-contacting is happening," said Nandita Vohra, a senior consultant to the Asian Development Bank. "Two or three levels down, one feels the supervision is not as intense as it is needed." India expects to spend $1 trillion, a sum roughly the size of its GDP, between 2012 and 2017 to boost its infrastructure. This is double of what it will spend in the five years to 2012. Some of this spending has been fast-tracked due to the Games: in addition to venues, a new airport terminal is due to open this month and new subways and roads are being built specifically for the athletes and the hundreds of thousands of visitors expected. New Delhi is also going through a makeover, with its colonial buildings being renovated and sidewalks ripped out to be repaved. Residents grumble about the chaos, pointing to rubble everywhere and roads that cave in due to underground tunnelling. "The scale and ability of contractors is going to be a huge issue and a risk for projects," Arvind Mahajan, an infrastructure specialist at consultancy KPMG, told Reuters. "Many of the bigger and key contractors are sold out, and cost factors, too, are pushing people to look at these smaller players. But if you push too much on cost, the quality would suffer, either in terms of execution or timelines not being adhered to," he added. 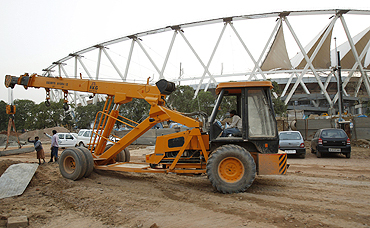 The infrastructure woes dogging the Games are not the first example of an Indian signature project going awry. Work on the Delhi Metro, a project backed by top officials, was delayed after an overhead bridge collapse in July 2009, killing five workers. A month later, strong winds blew off the roof of the new airport. While the construction opportunities in India are huge and capital is plentiful, analysts rue there aren't enough large-scale, quality projects worth financing. "There is a paucity of high quality, or even quality, projects that are financeable. It's not a question of capital being inadequate," Anil Ahuja, Asia head of private equity firm, told a recent conference as the audience nodded in approval.